Best trailer ever? Best trailer ever! Holy crap it’s Darth Vader(‘s helmet)! We hear the iconic heavy breathing – “My father has it” – “Has”? Present tense?! Is Anakin still alive? Surely not! Though, we haven’t seen anything of Max von Sydow who is amongst the cast, could he be playing the aged Sith? “I have it”. It’s R2-D2, hooray! Presumably that’s Luke’s hand giving him a pat on the head, he is a good droid. “My sister has it…you have that power too.” From the voice over we can assume that one of the hands in shot belongs to Leia, and I would guess that the other belongs to Rey, who is believed to be her daughter. 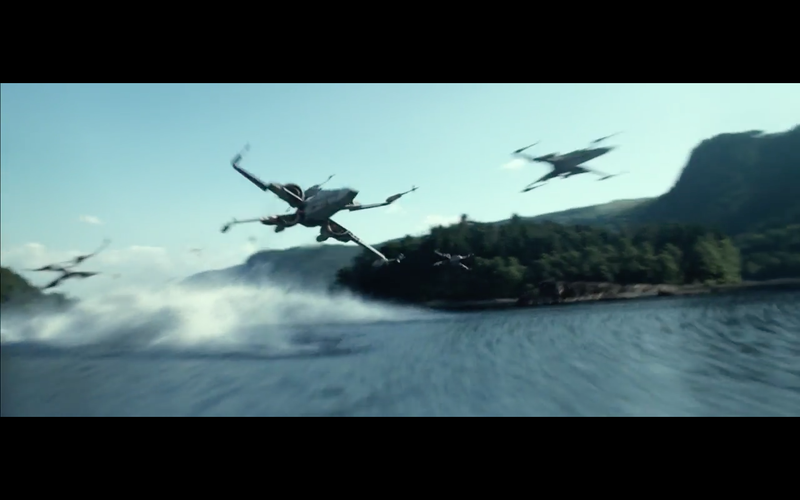 We then see a smattering of repeat footage from the teaser trailer, with X-Wings in formation. It would seem that we’re set for a fair amount of airborne battles in The Force Awakens – always a treat! Oscar Isaac as Poe Dameron. And our man behind said X-Wing’s wheel is pilot Poe Dameron, played by Oscar Isaac. Where he fits into the story has yet to be revealed, however we can expect him to be featured heavily, having been given a share of the limelight in both the teaser and full trailers. Now we’re talking. There’s that medieval looking lightsaber from the teaser again, and wielding it is Kylo Ren, who we see more of in just a moment…. ….Right after Finn (John Boyega), Rey and the “football droid” BB-8 make their great escapes from a big ol’ explosion. Rey (Daisy Ridley) certainly looks a bit less flustered than Finn here, and from the later shots we see of the pair it would seem that she is the more battle ready member of the pairing. Kylo Ren – He seems like a friendly chap! Our first clear shot of Kylo Ren reveals that he is wearing a pretty imposing mask. Adam Driver is believed to be the man behind the mask, however things are being kept close to director J.J. Abrams chest for the time being. I’m liking the distinct look that has been designed for Ren, following in the footsteps of the iconic looks of Darth Vader and Maul. An army of Stormtroopers converges, a war is brewing again, it would seem. Rey is here again, is she our lead protagonist? It certainly looks like it’s a possibility. More space battles are afoot, with a blink and you’ll miss it shot of a TIE Fighter in action. Following the peak at Boyega in Stormtrooper gear in the teaser trailer, once again we see him looking disheveled and in distress in the classic white uniform. My guess would be that he is in disguise, and that things haven’t gone quite as planned. What/who on Earth is this?! Whoever it is, he/she is very shiny, and very menacing! BB-8 also seems to be intrigued. In the earlier shot we saw BB-8 with Finn and Rey, have they sent him in to spy on the shiny Chrome Trooper above? Rey, daughter of Leia and Han? Whatever is happening here, it seems that Rey is unimpressed. Is she unhappy with her companion’s combat skills?…. ….Because he’s certainly looking a little flustered here (and he looks to be perpetually flustered each time we’ve seen him). Chewie and Han, partners in crime. It’s Han Solo everyone! Yes, he’s looking a touch older, but how good it is to see our old friend, along with Chewie, who has aged very well! “Chewie, we’re home”, proclaims Han Solo – cue euphoria, the classic score, and the title card – that is how you make a trailer ladies and gentlemen! Are you excited for The Force Awakens? Share you thoughts and theories on what’s to come in the comments below! To see the images in a shiny slideshow, click here.